Chelsea were denied successive Champions League victories by a late penalty needlessly given away by Salomon Kalou. Frank Lampard had done his part to silence his critics with his 172nd goal for the club early in the second half, before Soldado leveled from the spot three minutes from time. Juan Mata made his return to the Mestalla, just over a month after leaving, and Lampard came into midfield in place of Raul Meireles, with David Luiz and Florent Malouda the other changes from the weekend win over Swansea, replacing Anelka and Ivanovic respectively. The Blues looked the more likely in the opening moments, with Fernando Torres barged to the ground inside the area, when in one-on-one before Malouda nearly forced an own goal out of a nervy looking home defence. A replay of the Torres incident showed the Blues might have had a decent case for a penalty. 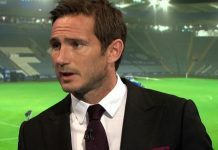 The next notable chance came in the 14th minute when Lampard drilled a free kick at Valencia keeper Alves after Ramires had been pulled down on the edge of the area. It would be the first of a string of saves from the home side’s stopper. The first half somewhat fizzled out after these early chances, with the home side finding a resolute Chelsea defence in their way, and the Blues lacking the final ball to create chances for the likes of Torres and Mata. The second half didn’t take long to come to life however, with Torres seeing his brilliant header somehow kept out by an astonishing save by Alves, only for the hosts to counter and Soldado be only a couple of inches away from connecting with a cross. Barely two minutes later Ramires broke through but lacked composure in his finish, only for Alves to then deny Torres again and punch away a deflection from the resulting corner in a breathless spell of football. Andre Villas-Boas’ side were now coming to the boil and there capped this spell of dominance by taking the lead in the 56th minute. Malouda took on the defender and cut back across the area, and Lampard was there to sweep home at the far post from 12 yards. It was Lamps’ 20th Champions League goal and on a personal note probably one of his most satisfying given the recent speculation surrounding the England midfielder. The home side were still struggling to get any sort of foothold in the game, and Mata was starting to enjoy his return, dancing past defenders and almost creating a goal, but Cole’s cross from the Spaniard’s pass was cut out. It wasn’t until the 71st minute that Petr Cech had any real saves to make, the big keeper tipping over Piatti’s volley. Chelsea had by this point seemingly settled for a solitary goal, and suddenly Valencia were on top, with the lively Piatti pulling a shot wide from the edge of the box. Cech produced another good save in the 84th minute from Oliveira’s curling effort. Then came the inexplicable moment of the match, when Salomon Kalou flicked a hand at a Valencia corner and the referee pointed to the spot. Soldado stroked home the kick to give the hosts the point they just about deserved given their growing pressure in the game. Andre Villas-Boas will be disappointed his side didn’t hold on for an impressive win, but a point in the Mestalla is still a good result. Especially given that the Blues next two games are against Genk, where two wins should seal qualification from the group. Anelka could have even won it late on but was denied by Alves, and some Chelsea frustration at the final whistle saw Cole and Mata pick up yellow cards. Valencia: Alves, Rami, Alba, Ruiz, Mathieu (Piatti 59), Miguel, Albelda, Banega (Oliveira 72), Canales, Pablo (Feghouli 72), Soldado.